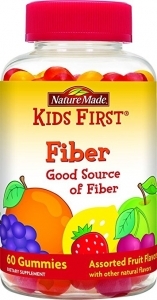 Nature Made Kids First Fiber Gummies are a great way to provide a good source of fiber to your kids’ diet. These great-tasting gummies come in assorted fruit flavors. Fiber helps support a healthy digestive system. It is important for kids to include fiber-rich food sources daily in their diet. Fruits, vegetables, legumes (beans), and whole-grain breads and cereals are good choices. If it is a challenge for your kids to consume these foods daily, Kids First Fiber Gummies can help supplement your child’s diet. Children ages 4-18 years: Chew two gummies daily. If minor gas or bloating occurs, reduce daily serving.